Compound sealing spacer for insulating glass, it keeps the advantages and overcomes the shortages of the traditional sealing spacer and fills up the blank of our country and is in the leading place within the country. Its quality is much higher than the traditional sealant and reaches to the international level, this is a revolutionary progress in the manufacture of insulating glass spacer. (1)Increasing holding power among the glass. The height of corrugated aluminum strip rises up to 4.8mm from 1.8mm, compression become much stronger, with macromolecular heat-resistant strip, the new compound sealing spacer for insulating glass can significantly improve the problem of deformation under pressure. Put the desiccant with a high proportion on the surface of plastic strip, make the properties of absorbing moisture improve significantly. 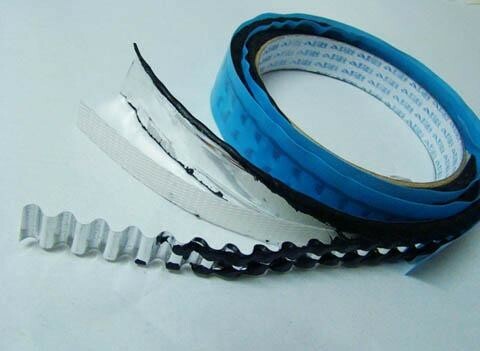 The framework of traditional strip is a single aluminum strip. Truspacer Compound sealing spacer is the framework which is composed of aluminum stripplastic insulation strip, the tensile strength has greatly improved. The use of four-storey composite foil vacuum packaging with humidity display card shows moisture absorption properties. You can spread single-component hot melt burly or Polysulfide adhesive on the outside of the Insulating Glass spacer, to enhance its structure. To have the largest sales and output volume in the domestic market. ShunTai Rubber Sealing Spacer Strip, a new material for insulating glass, is a high performance polymer produced with proprietary formula through special process. It has avoided complex and trivial procedures by integrating functions of sealant, drier and aluminum spacer, which makes it possible to replace several items of procedures only with the adhesive strip. 2 .Sound Insulation: To reduce outdoors noise to 27—50dBs. 3. Resistance to dew condensing and frosting: Dew point to be able to reach－4 40?C. 4. Seal ability: Uneasy access of moisture and dust into the space between the two pieces of glass. Special size is also available through special order. Technical Support: Every effort will be made to provide all-round technical service from the choosing of the size of the product in the beginning to the technical guidance and examination in practical operation.